An important, if one-sided, study on the history of architectural ideas as expressed in Cape Town. This book, adapted from the author’s PhD thesis, covers Cape Dutch homesteads and manor houses, the city’s slums and the garden city movement. It considers three areas of Cape Town’s architectural history – under Self, Other and Same – and each part could merit its own book. For theoretical ballast, Coetzer draws on the work of earlier theorists and pioneers of the City Beautiful and garden city movements, and town planning. Arguments for the ideal and improving impulses are juxtaposed against the messy reality of a spreading city in which ‘underclasses’ had to be accommodated. Wealth, older immigration and upper-class values infused by Englishness were uneasy bedfellows alongside poorer, more recent white and black immigration to the Mother City. How did they manage? cannot be read as a prequel − this risks projecting present-day values onto the past. Nonetheless, Coetzer’s arguments are stimulating. Many original ideas and insights kept me reading. The comprehensive bibliography, archival sources and end notes show that the author worked hard. 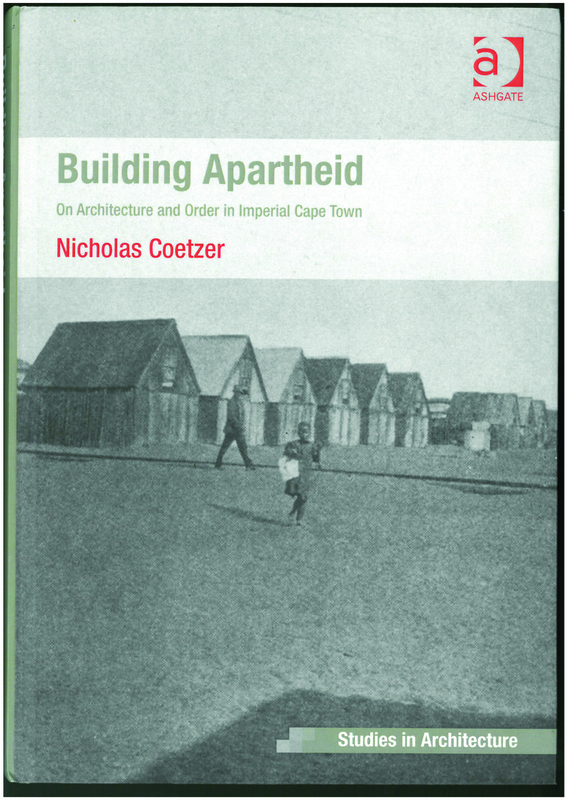 Coetzer’s book analyses the hidden meaning in the treasured Cape Dutch architecture. He argues that nationalist rhetoric, meshed with the imperial vision for South Africa, promoted Cape Dutch vernacular architecture as the favoured national style. His critique is scathing. Words such as spurious, slavish copyists, and dubious lineages show the author has little to admire. With no empathetic appreciation of the Baker tradition, this is a radical departure from earlier histories of Cape architecture. The author argues that the Cape Dutch style emerged from an appropriated, twisted history, resulting in a false national style and common architectural language adopted by the English and Afrikaners alike. But the economics behind affluence and land ownership is missing. Architecture expresses financial and business achievement, making statements about status and class. Coetzee discusses the attempts of town planners and architects to create beautiful city vistas and eliminate disorder and slums. He argues that the promotion of town planning principles excluded some. The Slums Act of 1934 cleared parts of old Cape Town, as the ‘other’ was offensive to the agents of Empire and middle-class English. The aesthetic considerations of those in power drove the improvement impulse. Appearance mattered more that structural soundness, and Coetzee argues that Cape Town was remade in the image of the City Beautiful. Again, an analysis of economics is lacking. How did the finances behind ownership affect demographic patterns of residence and business? Segregation and divisions in function could’ve been driven by economics as well as nascent apartheid ideology. The author is passionately outraged at the shaping of dominant white identity in the city, but this doesn’t make for a balanced history. The third part of the book considers the Garden City movement influence. Arts and Crafts romantic architecture beautified the city, but the negative was ‘its Panopticon logic and totalitarian potential’, revealed in Langa, contrasted with the whites-only counterpart, Pinelands. Apartheid was the next logical step to segregationist town planning. Judgement comes down on ‘the agents of Empire’ behaving in an anti-urban, paternalistic and hierarchical manner, but the coverage of the garden suburb houses and schemes is informative. The book’s scholarship and archival delving is impressive, but the singularity of Coetzer’s interpretation is a problem. As he sees all his material through the prism of pre-apartheid scheming, the nuances of 300 years of a city’s history remain hidden.